Description: KetoVie Café Raspberry Muffins have a 4.1 ketogenic ratio with only 2.2 g net carbs (total carbs minus total fiber). 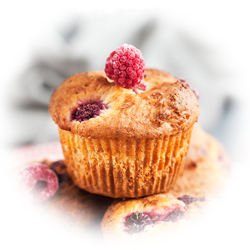 Enjoy KetoVie Café Raspberry Muffins for breakfast or at snack time. KetoVie is designed for individuals over one year of age and indicated for the dietary management of intractable epilepsy and other conditions managed by a ketogenic diet. Preparation: Remove muffin from foil tin and wrap in a lightly moistened paper towel. Microwave on medium heat until thawed or to desired warmth. Or, thaw overnight in refrigerator. Storage: Keep frozen until use. Once thawed, use within three days. Ingredients: Raspberries, cellulose, cream, organic palm fruit shortening, eggs, water, butter (cream, natural flavoring), almond flour, macadamia meal, natural and artificial flavor, sucralose, psyllium, cream of tartar, baking soda (sodium bicarbonate), salt, tocotrienol powder (maltodextrin, modified food starch) (to preserve freshness). Contains eggs, nuts and milk.